Laughter and a sense of humour can get you through the most challenging of times. As well as being our birthright, it’s a natural part of life that is innate. Observe a baby and you will see them begin smiling during the first few weeks of life and laugh within months of being born. Practising emotional sharing builds strong and lasting relationships and laughter is one of the most effective ways of keeping relationships fresh and exciting. This works in our love relationships as well as in our connections with co-workers, family members, and friends. A study in Japan found that laughter could improve anti-inflammatory factors in the blood of people who have rheumatoid arthritis. Another study published in 2003 showed that those who laughed (at a humorous movie) had higher levels of natural killer cell activity which increased the participants ability to fight off disease. However, the effect was only seen in the subjects who laughed out loud, not in those who quietly watched the comedy. By setting aside special times to seek out humour and laughter you will begin to incorporate both into the fabric of your life, finding it naturally in everything you do. Smile – Smiling is the beginning of laughter. When you hear laughter be drawn to it. Spend time with playful, fun people. There are people who laugh easily – both at themselves and at life’s absurdities, and who routinely find humour in everyday events. Bring humour into your conversations. Everyone has a moment in the day/week or their life where something funny has happened. Share those moments. Count your blessings. Consider the good things in your life and remember the good rather than fixating on the sad/bad. As humour and laughter become a part of your life, your creativity will bloom and new discoveries will await you. Humour will take you to a higher place where you can view the world from a more relaxed, positive, joyful, creative and balanced perspective. Laughter helps you relax and recharge by reducing stress, increasing energy, keeping you focused and accomplishing more. 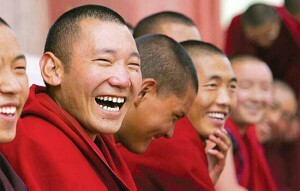 Laughter dissolves distressing emotions – when laughing you can’t feel anxious, angry or sad. Humour changes your perspective allowing you to see situations in a more realistic, less threatening light. By creating psychological distance (through humour) your reduce the chances of feeling overwhelmed. Humour and laughter in our communication with others strengthens our relationships, triggering positive feelings and fostering emotional connection. Surround yourself with reminders to help you see the light side. Place a funny toy on your desk or in your car. Hang a funny poster in your office. Frame pictures of you and the family having fun. Choose a computer screen saver that makes you laugh. Carry a photo in your wallet/handbag of your loved ones laughing. Learn to laugh at yourself. This will help you to not take yourself too seriously. Keep things in perspective. There are many things in life that are beyond our control, particularly how others behave. Manage stress. Stress is a major obstacle to humour and laughter. Observe children and emulate them. Find the child within. Children are experts at taking life lightly, enjoying laughter and ensuring there is always time to play. Attempt to find the positive/humorous facets in situations. Look for the lighter side of a negative situation, and uncover the irony and absurdity of life. This will enhance your mood and the mood of those around you.